We make sure that the job is done right the first time. Need Help With Your Heating or Cooling Equipment? 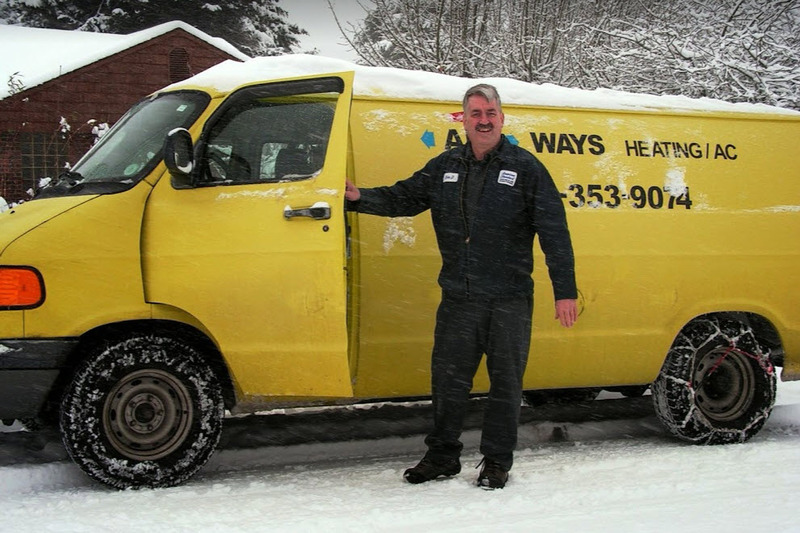 All Ways Heating & AC has been helping people throughout Snohomish and North King for years with heating repairs. We also provide preventive maintenance and tune ups. Our expert, dependable service will give you peace of mind knowing that your heating and cooling needs are in good hands. Ken Dinsmore, owner, always stands behind his work. After years working in and learning the HVAC trade, he started his own company in 1995. Since then he has continued to learn and provide expert service that his customers depend on to keep their homes warm in the winter and comfortable in the heat of the summer. Whether your existing system needs maintenance service, or needs repairs, Ken’s experience and training will help you in choosing the best option for your home and budget. For fast expert service you can All-Ways depend on, call Ken at (425) 353-9074. $119 complete service. Limited Time Offer! Please present coupon when technician arrives. Valid March 1st to Oct. 31st, Monday thru Friday 9am to 4pm. All Services Guaranteed. Furnace must be in operational condition, no difficult locations, crawl spaces, etc. Can not be combined with other offers. Please present coupon when technician arrives. Valid Mon. thru Friday 9am to 4pm. Good on repairs of $150 or more. All Services Guaranteed. Can not be combined with other offers. Please present coupon when technician arrives. Valid Mon. thru Friday 9am to 4pm. Good on repairs of $200 or more. All Services Guaranteed. Can not be combined with other offers. Copyright text 2018 by Expert Heating & Cooling Service - Snohomish - North King | All Ways Heating & AC - Everett, WA 98203.